YEREVAN, SEPTEMBER 12, ARMENPRESS. On August 28, in accordance with the arrangement reached with the authorities of the Republic of Artsakh (Nagorno Karabakh Republic), the OSCE Mission conducted a planned monitoring of the ceasefire regime on the Line of Contact between the armed forces of Artsakh and Azerbaijan, at the Omar pass, the foreign ministry of Artsakh said. 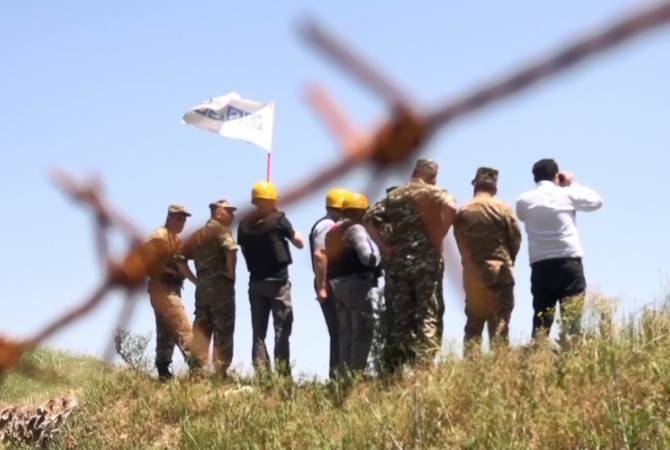 As ARMENPRESS was informed from the press service of MFA Artsakh, from the positions of the Defense Army of the Republic of Artsakh, the monitoring was conducted by Personal Representative of the OSCE Chairperson-in-Office (CiO) Ambassador Andrzej Kasprzyk and his Field Assistant Mihail Olaru (Moldova). From the opposite side of the border, the monitoring was conducted by Field Assistant to the Personal Representative of the OSCE Chairperson in Office (CiO) Ognjen Jovic (Bosnia and Herzegovina) and Personal Assistant to the CiO Personal Representative Simon Tiller (Great Britain). Edited by onjig, 12 September 2018 - 04:40 PM.